Was Paul writing to North Galatia or South Galatia? Commentators debate this question. While we hold to the South Galatian view, let’s consider both theories. Under this view, Paul wrote to the churches that he reached on his second missionary journey. These people were the ethnic Galatians (or Gauls), who occupied the territory of Asia Minor. According to this theory, Paul visited these cities (e.g. Ancyra, Tavium, Pessinus) in between his work in Pisidian Antioch and Troas (Acts 16:6). This view was held by almost all interpreters up until the 18th century, and it has been affirmed by J.B. Lightfoot, James Moffat, and James Montgomery Boice. First, Acts does not explicitly mention that Paul ever went to North Galatia. Even though Acts 16:6 and 18:23 might allude to Paul going to Northern Galatia, it doesn’t explicitly say that he did. Luke could’ve mentioned these churches in North Galatia in a single sentence in Acts 16:6-7. However, we would expect him to mention a movement of this caliber. The movement in Acts 13-14 seems to match what we read in Paul’s letter to the Galatians. Second, Barnabas was on the first missionary journey—not the second. Paul mentions Barnabas three times in his letter to the Galatians (Gal. 2:1, 9, 13), which implies that this church was familiar with him. Of course, Barnabas travelled with Paul on his missionary journey through South Galatia (Acts 13-14). But remember, Paul and Barnabas split up in Acts 15:39, because of their dispute over John Mark. In other words, Barnabas was never in the North Galatian region. Why would Paul mention Barnabas to the North Galatian churches, if Barnabas had never been there? He even speaks about Barnabas with high respect (Gal. 2:13). Why would the North Galatians be surprised by Barnabas’ hypocrisy, if they had never met him? Third, “Galatians” was a broad term. Paul didn’t have a term to describe all of the peoples in Antioch, Lystra, Iconium, and Derbe. Galatians was the best term to include all of these people. Fourth, we have no history of any churches in the North Galatian region. Even proponents of the Northern Galatian theory admit this key point. Fifth, if Paul went into North Galatia, it would have been a massive detour. To go up to these cities, Paul would’ve been making a huge detour. Paul would’ve gone northeast and then backtracked west to get to Troas, which would’ve been entirely out of his way. Sixth, in addition to this detour, Paul was sick when he made the trip. In order to get to North Galatia (from Pisidian Antioch; Acts 16:6), Paul would have needed to cross a thick mountainous terrain. This is unlikely because Paul said that he was sick when he came to Galatia (Gal. 4:13). This would have been a further deterrent for him going out of his way. Eighth, Luke is simply describing ethnic Galatia (in Acts), while Paul is describing proper Galatia (Galatians). One of the disputes is that Luke and Paul use the term Galatia differently, but this can be resolved when we realize that Luke generally used ethnic names to describe the provinces of Galatia, while Paul apparently used proper names in describing them (2 Cor. 8:1; 1 Cor. 16:19; 2 Cor. 1:1). The fact that Acts 18:23 says that Paul strengthened the disciples seems to imply that he had already been there (i.e. on his first missionary journey). Ninth, the persecution by Judaizers fits with the South Galatian theory nicely. On Paul’s first missionary journey (in South Galatia), Luke records, “The Jews incited the devout women of prominence and the leading men of the city, and instigated a persecution against Paul and Barnabas, and drove them out of their district” (Acts 13:50). Other Jewish religious leaders had Paul stoned on this first missionary journey (Acts 14:19). This would fit with a strong and contentious Jewish population in the region Paul was writing to. The “Gauls” came from France, and they became the Gaulatians. This describes the Roman province of Galatia. First, the Jewish leaders allow Paul and Barnabas to speak in the Synagogue (v.14-15). At this point in Christian history, the Jews were friendly to the open teaching of the gospel. Paul—a rabbi—was invited to speak at the synagogue. Second, Paul recaps the story of Israel, and he presents Jesus as the final culmination of the story (v. 16-41). Paul gives the story of Jesus from the Old Testament Scriptures. Christ was the culmination of this story. Paul saw the story as seamlessly being fulfilled in Jesus. Third, the ‘God-fearing’ Gentiles were excited to hear that they were a part of the story. This is what incited the Jewish contingent to be jealous and angry. Later in Romans 11, Paul writes that the salvation of the Gentiles would cause jealousy in the Jews, but would hopefully draw them to faith in Jesus (Rom. 11:11, 14). Fourth, Barnabas is the “encourager,” who gets Paul to speak. Barnabas’ name means “the son of encouragement.” Without an encourager like Barnabas, Paul might not have been the hot-shot speaker that he was. Fifth, Paul is “sent” at Antioch. In Galatians 1:1, Paul says that he was not sent from men. In Acts 13:1-2, we read that it was the Spirit of God who publicly called him forward to serve. Paul got a private calling in Acts 9; he got a public calling in Acts 13. First, the Jewish religious leaders chased Paul and Barnabas to the next city, because they were so jealous. Paul understood this, because he had just been doing this before he himself came to Christ (Acts 9). Second, the Jews were jealous because the Gentiles were coming to faith. This also matches with Galatians. There is a controversy between the Jews and Gentiles. The Jews resisted Paul and Barnabas’ message (v.2). Third, the Galatians were largely a Gentile church plagued by resistant Jewish teachers. We learn that this was a church that was filled with Greeks (v.1). Don’t miss the controversy in this church! In the Acts 13, many of the Jewish population were upset that the God-fearing proselytes (uncircumcised Gentiles) were able to come to faith. This becomes the major controversy in Galatians. After Paul leaves this church, the false teachers enter, and they try to get the Gentile believers to circumcise. Paul gets word of this false teaching, and he is furious! This is the setting of Galatians: a battleground for grace! Date: When was Galatians written? Since we adopt the South Galatian theory, we can date this letter just before the Council of Jerusalem. Carson and Moo write, “If the council [of Jerusalem] is rightly dated A.D. 48, then this is the date of Galatians.” Paul probably wrote Galatians in Acts 14:28, when he was resting after his first missionary journey but before his trip to the Council of the Jerusalem. He must have written this letter almost immediately after he planted this church, because he writes that the believers had so “quickly” deserted the gospel (Gal. 1:6). Most commentators do not believe that we should add the 3 years of Galatians 1:18 with the 14 years of Galatians 2:1. Instead, Paul is saying that three years after his conversion he went to Jerusalem, and fourteen years after his conversion he went up again to Jerusalem. In other words, both numbers start from his conversion, rather than being added upon one another. Paul tells the Corinthians that he instructed the Galatians to give to the poor (1 Cor. 16:1). And yet, when we read Galatians, Paul doesn’t mention this to them, even though he does mention the poor (Gal. 2:10). This means that Paul likely spoke to them after Galatians was written but before 1 Corinthians was written. Most scholars agree that 1 Corinthians was written sometime around AD 53-54. Therefore, Paul must have written Galatians before this time. R. Alan Cole dates the letter “in the immediate context of the Council of Jerusalem or just after it.” Ronald Fung dates the letter to AD 48. This would effectively date the letter around AD 48-49. We would date the letter sometime before the Council, around AD 47-48. 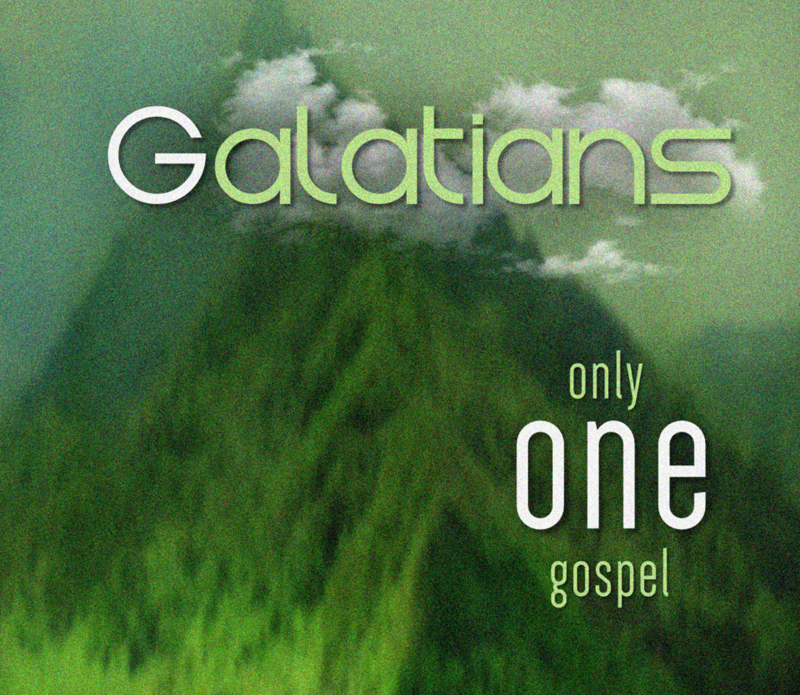 Many scholars believe that Galatians is arguably the earliest NT letter. While scholars do go back and forth between this letter and the book of James, many believe this was Paul’s first letter. Audience: What was going on in this church? The best way to know what was happening in this church is by looking carefully at the letter itself. Here are a number of passages from Galatians that give us a window into what was happening in the churches of Galatia. This passage teaches three things. First, the members of the church in Galatia were abandoning the gospel. Second, there were false teachers coming into the church, who were motivating the members to do this. Third, this had happened “quickly” after Paul left. The word for trouble here is tarassō, which is also used in Acts 15:24. It means to shake or to agitate. In both cases, the Christian believers had their faith threatened by false teaching. The NASB/NLT says that these false brethren were “brought in” to the church. It must have been that these false believers (pretending to be believers) were coming into Christian meetings, spreading false doctrine. This is where we get the term “Judaizer.” Paul uses the verb form here (Greek Ioudaizein, “live like Jews”). Peter was falling prey to this temptation to “Judaize” Gentile converts. The false teachers had entered into this church. They had deceived the Christians there. You can see Paul’s horror in this passage. He was just with them, and they were following God and grace. But now? They have been deceived! Paul wants them to realize that there are false teachers, and he wants them to learn discernment in being able to spot them. What were the false teachers teaching the believers? It seems clear that they were teaching them Jewish formalism. They were trying to get them to obey holy days. The false teachers were preaching circumcision for the purpose of sanctification. Paul says that these men were using “persuasion” to steer people away from the gospel. While this Jewish formalism and legalism was clearly unbiblical, we need to sympathize with their thinking. Many of these traditions had been held as sacred for over 1,500 years! It must have been difficult for them to drop these overnight for God’s new and fulfilled work in the Cross. Up until this point, God-fearers had to become circumcised in order to come to the faith. Thus, by appealing to tradition, these Judaizers must have been persuasive when arguing for formalism and legalism. (6:12) Those who desire to make a good showing in the flesh try to compel you to be circumcised, simply so that they will not be persecuted for the cross of Christ. There was apparently a deep desire to conform to the established legal religion of Judaism. Since Christians were taking a radical divergence from Judaism in the new covenant, persecution quickly followed. (1:1) “Paul, an apostle (not sent from men nor through the agency of man, but through Jesus Christ and God the Father, who raised Him from the dead).” Paul is already laying the foundation for his authority as an apostle. He didn’t receive his authority from the other apostles or anyone else. He received it directly from “Jesus Christ and God the Father.” This will become important as the book unfolds, because the false teachers are questioning the legitimacy of Paul’s gospel, and supplanting it with their own. Paul repeatedly takes his stand on getting his gospel directly from the authority of Jesus—not humans. Paul contrasts being sent “by men” and being sent “by Jesus.” This may be early evidence of a high Christology (i.e. Jesus being God). At the very least, we can infer that Jesus wasn’t a mere human being; otherwise, there would be no contrast. Galatians is (arguably) our earliest epistle, and in the first line, he’s already saying that Jesus was “raised… from the dead.” The resurrection wasn’t a later legend of the early church. Paul assumes the truth of the resurrection, seeing no reason to defend it to his audience. (1:2) “And all the brethren who are with me, to the churches of Galatia.” The previous verse made it sound like it was “Paul is against the world.” But consider this verse: Paul enjoyed fellowship and working with other people, rather than working alone. (1:3) “Grace to you and peace from God our Father and the Lord Jesus Christ.” The gospel message in this book is the way to have “grace” and “peace” with God. (1:4) “[Jesus] gave Himself for our sins so that He might rescue us from this present evil age, according to the will of our God and Father.” The present evil age in this context is false teaching and legalism in the church. Fung writes, “In this context, ‘age’ (aiōn) has much the same force as ‘world’ (kosmos) often has in the writings of John (e.g., 1 Jn. 2:15–17) and which both words can have in Paul’s letters (e.g., 1 Cor. 1:20; 2:6; 3:19).” At the end of the letter, Paul will write that “the world has been crucified to me, and I to the world” (Gal. 6:14). (Gal. 1:1-5) Why doesn’t Paul pray in his introduction? (1:6) “I am amazed that you are so quickly deserting Him who called you by the grace of Christ, for a different gospel.” It would have been very easy for Paul to make this a horizontal and personal issue between him and this church. Instead, he makes this a vertical and theological issue between them and Christ. Since the gospel is wrapped up with Christ’s work, deserting the gospel is deserting him. To “desert” (metatithesthe) means “to have a change of mind in allegiance” (BDAG). It is used of one of the torture victims refusing to “turn away” from Judaism and embrace the Paganism of Antiochus (2 Macc. 7:24). They were turning away from the one who called them “by grace.” They were exchanging the grace of God for legalism. Notice the present tense: the Galatians were in the process of deserting Christ. The story wasn’t over. Paul is writing to get them back on track. Paul clearly has a harsh “tone” here (Gal. 4:20). (1:7) “[This different gospel] is really not another…” There aren’t different levels of good news from religion. It’s either the gospel (thesis) or no gospel (antithesis). The gospel is not like the difference between aspirin and ibuprofen; it’s the difference between antibiotics and arsenic. Paul was no relativist. “…only there are some who are disturbing you and want to distort the gospel of Christ.” False teachers crept into this church quickly after Paul had left it, and they were distorting the gospel message. Like dripping a single drop of poison into a clean glass of water, legalism spoils the message of grace. After all, what is “good news” about having to live a scrupulous moral life under the constant fear of judgment? It must have been difficult to plant this church and quickly leave it. We wonder if Paul felt reticent to leave one of his first church plants (Acts 13-14), worrying that they might fall away after he was gone. It turns out that this nightmare became a reality. Paul writes “We have said before,” which implies that this was a repeated teaching. Perhaps he foresaw this conflict arising. (1:10) “For am I now seeking the favor of men, or of God? Or am I striving to please men? If I were still trying to please men, I would not be a bond-servant of Christ.” Paul’s words and “tone” (cf. Gal. 4:20) were likely offensive, but he had decided that he would rather speak the truth in love, rather than placate false teachers. In the words of Os Guinness, Paul was living for “the audience of One.” (cf. Eph. 6:6; Col. 3:22). (1:11-12) “For I would have you know, brethren, that the gospel which was preached by me is not according to man. 12 For I neither received it from man, nor was I taught it, but I received it through a revelation of Jesus Christ.” Paul isn’t taking his mission or beliefs from humans. He’s claiming to get it directly from Christ. But how does Paul substantiate this extraordinary claim? Paul gives several arguments to support this claim. Paul had previously been a hostile, violent persecutor of the church. What could possibly have caused such a radical change in his life? Paul points out that the best explanation for this is that he had a true encounter with Jesus, as he mentioned in verse 12 above. (1:13) “For you have heard of my former manner of life in Judaism, how I used to persecute the church of God beyond measure and tried to destroy it.” Paul gives his testimony as evidence of the fact that verse 12 is true. Why would he stop persecuting Christians unless a cataclysmic change occurred (such as Jesus appearing to him)? The Judaizers were claiming to be authentically Jewish and grounded their argument in their ethnicity. Paul argues that he has them beat: Not only was his entire “manner of life in Jerusalem,” but he was also a “persecutor” of Christians. (Gal. 1:13) Did Paul’s personality change after his conversion? (1:14) “I was advancing in Judaism beyond many of my contemporaries among my countrymen, being more extremely zealous for my ancestral traditions.” The Judaizers probably argued that their gospel went back to the traditions passed on from Jerusalem. But Paul has them beat: he was at the top of his class when it came to the “ancestral traditions” of Judaism. He not only had an incredible intellect, but he was also incredibly zealous. (1:15-16) “But when God, who had set me apart even from my mother’s womb and called me through His grace, was pleased 16 to reveal His Son in me so that I might preach Him among the Gentiles, I did not immediately consult with flesh and blood.” What accounted for Paul’s change in life? One word: God. Paul radically changed because Jesus had personally appeared to him. (Gal. 1:15) Does this passage support the doctrine that God predestines some people to heaven and others to hell? Here we need to be careful. It is our view that Paul is not appealing to Peter and James as authorities over him. Paul has already pointed out that the gospel message itself has authority over angels, teachers, and even the apostles (Gal. 1:8-9). Paul is debunking the Judaizers’ claim that his gospel contradicted the gospel in the church in Jerusalem. (1:18) “Then three years later I went up to Jerusalem to become acquainted with Cephas, and stayed with him fifteen days.” If Paul had in any way doubted that his gospel was authentic, then why would he wait three years to go to Jerusalem? Paul viewed his experience of the risen Jesus to be as just as authentic as the other apostles (cf. 1 Cor. 15:8ff). Paul uses the term historesai (“to become acquainted with”) to describe his trip to Jerusalem. This is the only use of this word in the NT. Its noun form can be translated as “one who knows,” “one who has seen,” or “one who is acquainted with the facts.” Its verb forms can be translated as “to investigate,” “to enquire,” and “to investigate.” The word was later used for “history” itself by the time of Aristotle (Poet., 9, p. 1451b, 3) and Herodotus (History, 2.99.1). While there is some doubt as to whether this classical definition should be applied to Paul’s usage, we have to consider the context: After all, Paul surely didn’t travel all the way to Jerusalem to “shooting the breeze” for two weeks. No doubt, Paul was badgering Peter with questions about Jesus’ earthly ministry—almost like a historical investigation. Since Paul didn’t have the privilege of knowing Jesus before his ascension, he wanted to confer with Jesus’ disciples who had all of this historical data. Fung writes, “Peter must have been an invaluable source of information concerning Jesus’ life and ministry… The two apostles can hardly have avoided talking about the earthly life and ministry of their common Lord.” Fung also points out that the only two names mentioned here (Peter and James) are also listed in Paul’s list of the eye witnesses of Jesus’ resurrection appearances (1 Cor. 15:1-7). (1:19) “But I did not see any other of the apostles except James, the Lord’s brother.” Paul only met with Peter and James at this time. James had been a skeptic of his brother (Mk. 3:21; Jn. 7:5), until Jesus appeared to him after his resurrection. Later in the book, Paul will point out that these Judaizers came “from James.” Here Paul points out that he himself came “from James,” so to speak, and James agreed with Paul’s gospel—not theirs. This statement would make the Judaizers shrink in their seats! (1:20) “(Now in what I am writing to you, I assure you before God that I am not lying. )” Again, we see the main reason for Paul giving his testimony: He is trying to demonstrate the truth of his gospel and why it should be believed. (1:21-24) “Then I went into the regions of Syria and Cilicia. 22 I was still unknown by sight to the churches of Judea which were in Christ; 23 but only, they kept hearing, ‘He who once persecuted us is now preaching the faith which he once tried to destroy.’ 24 And they were glorifying God because of me.” Paul didn’t stop in Jerusalem. He went and visited all the believers in Syria and Cilicia (v.21), and word spread to all the churches in Judea (v.22). All of these believers confirmed Paul’s testimony and change of life (see Argument #1 above). This would really make the Judaizers sink in their seats: Paul’s testimony could be confirmed by the very same people he used to persecute! (v.23). In fact, these same believers were praising God for Paul! Acts records that the Jerusalem believers were afraid when they first met Paul after he came to Christ. After all, Paul was a violent murderer (Acts 9:26). It took Barnabas to vouch for Paul’s authenticity (Acts 9:27). In our view, all of these events align with Luke’s compressed account in Acts 9:21-29). (1) Ask the group to pick out the reasons Paul gives for why he should be trusted in his claim that his gospel is true. We shouldn’t trust the authority of humans—only Christ (vv.8-9). Paul received his gospel directly from Christ (vv.11-12). He gives evidence for this claim by appealing to his testimony. He notes that he had been a persecutor of the church—not an apostle. But his life entirely changed after meeting the risen Christ (vv.13-17). He notes that he didn’t need to go square his gospel with the other apostles, because he was so certain his was correct. He notes that he did meet the apostles, but this wasn’t the basis of his authority. Finally, all of the churches could be called to the stand to support his testimony. With evidence like this, why wouldn’t the churches in Galatia respect Paul’s authority? Paul is arguing that these false believers (v.7) couldn’t stand up to his credentials and evidence for the veracity of his gospel. (2) People in our culture generally claim that objective truth does not exist when it comes to spirituality (maybe show a movie of people being interviewed on this topic or read a quote?). It seems that Paul disagrees with this view. How would you critique this perspective of relativism? What do you believe is at stake in holding to truth versus relativizing it? (3) Paul seems to be pretty angry in this section, even having a harsh “tone” (Gal. 4:20). When do you think it’s appropriate to get angry as a believer? When is it wrong to get angry? Consider reading Ephesians 4:26 (“Be angry, and yet do not sin”) or John 2 where Jesus clears the temple. Is it possible to be zealous for the truth without being self-righteous or condescending? Remember, Paul has been arguing against the Judaizers, who were claiming that Gentiles must be circumcised in addition to believing the gospel. Paul has been marshalling arguments against their view. Here, Paul argues that the other apostles in Jerusalem agreed with his gospel—not theirs. (Gal. 2:1-10) Is this passage referring to the Council of Jerusalem (in Acts 15) or is it something else? (Gal. 2:1) What did Paul do in the 14 year period before his second journey? (2:1) “Then after an interval of fourteen years I went up again to Jerusalem with Barnabas, taking Titus along also.” Paul took a second trip to Jerusalem. This time, he took Barnabas and Titus with him. The fourteen year interval is marked from Paul’s conversion; it isn’t added to the three years mentioned earlier (Gal. 1:18). Barnabas was a Jewish coworker of Paul’s. He was a Levite (Acts 4:36-37), and he was called the “son of encouragement.” He was the cousin of John Mark—the writer of the gospel of Mark and Paul’s coworker in Acts 15 (Col. 4:10). He was considered an apostle alongside of Paul (1 Cor. 9:3-6; Acts 14:4, 14). Acts records that Barnabas “was a good man, and full of the Holy Spirit and of faith. And considerable numbers were brought to the Lord” (Acts 11:24). Titus was a Gentile coworker of Paul’s. While he is never mentioned in Act, the epistles mention him frequently. Titus had worked in the church of Corinth (2 Cor. 8:23), and he comforted Paul during a time of deep depression (2 Cor. 7:6). He seems to be a very selfless and honest leader (2 Cor. 12:17-18). He later planted churches in Crete (Titus 1:4-5) and Dalmatia (2 Tim. 4:10). (2:2) “It was because of a revelation that I went up…” Paul went up to Jerusalem because of Agabus’ revelation that the city of Jerusalem would be in severe famine and poverty (Acts 11:28-30). This makes sense of Paul’s statement that he wanted to care for the poor (2:10). Paul didn’t go up to Jerusalem to check to see if he had the true gospel. Fung writes, “There was already no question of Paul’s seeking the apostles’ authorization for his mission or message. He went up to see if the other apostles had the true gospel. Paul uses this story to show that the “Galatians [are the ones] who have moved ground, not Paul.” Paul was preaching the same gospel that he always had. This cannot be the Council of Jerusalem (Acts 15), because Paul spoke to these men “in private,” while the Council of Jerusalem was public. Again, this must refer to the visit in Acts 11. (Gal. 2:2, 6, 9) Why does Paul write that these men were of reputation? Is he being condescending? (2:3) “But not even Titus, who was with me, though he was a Greek, was compelled to be circumcised.” All of the Jerusalem apostles refused to circumcise Titus, who was a Greek. This would be a direct affront to the message of the Judaizers. While a door was opened for the false teachers, this verse also shows that the Judaizers were actively trying to work their way into the fellowship (“sneaked in to spy out our liberty”). Paul could be alluding to the fact that history was repeating itself in Galatia: the false teachers were again trying to kill the liberty of the believers. (2:5) “But we did not yield in subjection to them for even an hour, so that the truth of the gospel would remain with you.” Paul encountered Judaizers before, but he didn’t give in to their religious pressuring. Paul fought for grace for the benefit of other believers (“so that the truth of the gospel would remain with you”). (2:6-9) “But from those who were of high reputation (what they were makes no difference to me; God shows no partiality)—well, those who were of reputation contributed nothing to me. 7 But on the contrary, seeing that I had been entrusted with the gospel to the uncircumcised, just as Peter had been to the circumcised 8 (for He who effectually worked for Peter in his apostleship to the circumcised effectually worked for me also to the Gentiles), 9 and recognizing the grace that had been given to me, James and Cephas and John, who were reputed to be pillars, gave to me and Barnabas the right hand of fellowship, so that we might go to the Gentiles and they to the circumcised.” In the heart of Jerusalem, none of the apostles conceded to law teaching. Instead, they all agreed that Titus could go uncircumcised, and added nothing to the gospel (“contributed nothing to me”). Paul explained his gospel, and the other apostles “contributed nothing” to it and “gave [him] the right hand of fellowship” (v.6, 9). The “men of reputation” could refer to the other, non-apostolic Christian leaders in Jerusalem. Or it could refer to the apostles listed in context (e.g. James, Peter, and John; see v.9). Paul has already told us that he didn’t need to verify his gospel with the other apostles, receiving it directly from Christ (1:12). But he went the extra mile to show his audience that he did anyhow, and the other apostles agreed with him—not the Judaizers. (2:10) “They only asked us to remember the poor—the very thing I also was eager to do.” This passage lines up with the Jerusalem visit of Acts 11:28, because Agabus gave a prophecy “by the Spirit” (i.e. “revelation,” Gal. 2:2) about the “great famine” (i.e. “remember the poor,” Gal. 2:10). Argument #5: Even Peter was corrected by the gospel message. So far, Paul has argued that he received his gospel directly from Jesus Christ (1:12). He supports this claim by arguing that (1) it radically changed him from a persecutor into a preacher, (2) Peter and James agreed with his gospel, (3) the churches of Cilicia, Syria, and Judea accepted him and his gospel, and finally (4) the main pillars of the Jerusalem church agreed with his gospel. At this point, the Judaizers would really be shaking in their boots. Paul has all of the big guns on his side of the argument. But he goes a step further. Here he argues that the gospel even has authority over the apostles themselves. Remember, Paul originally wrote, “Even if we [apostles]… should preach to you a gospel contrary to what we have preached to you, he is to be accursed!” (Gal. 1:8). Paul has been arguing that the truth of the gospel has a transcendent authority—even over the apostles. To prove this, he gives an example of how Peter needed correction by the gospel message. (2:11) “But when Cephas came to Antioch, I opposed him to his face, because he stood condemned.” Apostles weren’t perfect. They could make errors. Paul “opposed” him (or “stood up to him” antestēn). Peter was “condemned” (kategnōsmenos), which can be rendered “in the wrong” (NIV) or “convicted” (BDAG). (2:12) “For prior to the coming of certain men from James…” These “men from James” were not associated with James or sent by James. In fact, elsewhere James explicitly denies being responsible for these men: “We have heard that some of our number to whom we gave no instruction have disturbed you with their words” (Acts 15:24). Paul most likely means that these men were around James, but they did not follow James’ teaching. If someone came to Bible teachings at your church and then went and taught heresy, would you be responsible for this? Of course not. Neither was James. “…but when they came, he began to withdraw and hold himself aloof, fearing the party of the circumcision.” Fear led Peter to submit to social pressure. He would originally eat with the Gentile believers, but the circumcision party pressured him out of this. This would be similar to a white, Mississippi pastor in the 1950’s spending time with black Christians. If he stopped spending time with them, he would be communicating something terrible about God! Just imagine the pressure you would feel if you were Peter. You are only a simple fisherman, who was never educated in the prestigious rabbinical schools (Acts 4:13). Now, a whole host of ex-Pharisees (Acts 15:5) and Jewish ex-priests (Acts 6:7) have come to faith in Jesus, and they are challenging your views. It would be easy to capitulate to their great scholarship and religiosity. This social pressure doesn’t make Peter’s decision right, but it does give us context as to why he acted the way he did. (2:13) “The rest of the Jews joined him in hypocrisy, with the result that even Barnabas was carried away by their hypocrisy.” Note the far-reaching effects of legalism and hypocrisy. It affected the entire Jewish church, and it even spread to a strong believer like Barnabas. This issue of table fellowship was not a peripheral issue, but a central issue. Paul calls it “not [being] straightforward about the truth of the gospel.” Peter’s actions communicated heresy about the nature of the Christian message—that there is “neither Jew nor Greek” in Christ (Gal. 3:28). While Paul met privately with the apostles before (Gal. 2:2), here he rebukes Peter “publically.” Since Peter’s actions had public ramifications, he needed to be publically rebuked. Peter still struggled with the sin of man-pleasing. He fell prey to man-pleasing when he denied Christ, and when he hesitated to eat with Cornelius the Gentile (Acts 10-11). Here, he is still falling prey to the sin of man-pleasing (contra Gal. 1:10). By not eating with the Gentiles, Peter was subtly saying that these Gentile Christians should adopt the Jewish food laws. (2:15) “We are Jews by nature and not sinners from among the Gentiles.” Paul is using sarcasm to refer to “Gentile sinners” (NIV). Paul is not being condescending toward the Gentiles. In fact, just the opposite. Later, he calls himself a sinner (v.17). (2:16) “Nevertheless knowing that a man is not justified by the works of the Law but through faith in Christ Jesus, even we have believed in Christ Jesus, so that we may be justified by faith in Christ and not by the works of the Law; since by the works of the Law no flesh will be justified.” He makes it clear that the gospel is by faith—not works. He uses this dichotomy three different ways. (2:17) “But if, while seeking to be justified in Christ, we ourselves have also been found sinners, is Christ then a minister of sin? May it never be!” Does Christ accept sinful law breakers? Yes! Does this mean that Christ promotes sinful law breaking? Not at all! (2:18) “For if I rebuild what I have once destroyed, I prove myself to be a transgressor.” Paul seems to be saying that if we introduce law after coming to Christ by grace, then we only prove our need for grace even more. If we go back under the law (“rebuild what I have once destroyed”), then it only convicts us further. (2:19) “For through the Law I died to the Law, so that I might live to God.” The law brought about death. Out of this death, we are a “new creation” in Christ (2 Cor. 5:17). Our new power for a sanctified life is not through the law. Note the present tense, which refers to sanctification—not justification here (“so that I might live to God”). (2:20) “I have been crucified with Christ; and it is no longer I who live, but Christ lives in me; and the life which I now live in the flesh I live by faith in the Son of God, who loved me and gave Himself up for me.” We are a new creation. Christ lives in us. To go back under law would be to deny this new creation. This connects our death to Adam with our new identity in Jesus. For a fuller exposition on this topic, see Paul’s teaching in Romans 5:12-8:17 (“Introduction to Romans”). (2:21) “I do not nullify the grace of God, for if righteousness comes through the Law, then Christ died needlessly.” Why did Christ die if we were only going to go back under the law? The Judaizers had a low view of Christ’s finished work, which “nullified” the grace of God.. The word “nullify” (atheteō) means “to reject something as invalid, declare invalid, nullify, ignore” or “to reject by not recognizing something or someone, reject, not recognize, disallow” or “to make of no account, be insolent /offensive” (BDAG). Adding works to grace effectively results in offending the grace of God. (1) Peter could have easily focused on his own pride in Acts 15 after Paul had just publicly rebuked him in Galatians 2. Who is the greater hero of faith in this section? Paul who had the courage to correct Peter’s error—or Peter for showing humility in accepting his rebuke and agreeing with Paul? What do we learn about how to rebuke and how to accept rebuke from this scenario? (2) All of us are tempted by legalism—even Peter and Barnabas struggled with it. What is it about legalism that is so tempting for believers? Why wouldn’t believers naturally prefer grace over legalism? Because the “who” is singular, it’s possible that there was an “arch-Judaizer,” who was the ring leader of this heresy. (3:2) “This is the only thing I want to find out from you: did you receive the Spirit by the works of the Law, or by hearing with faith?” Believers receive the Holy Spirit at conversion through faith—not by good works. So the Galatians would have to agree with the second half of the question: They started their relationship by faith—not works. (3:3) “Are you so foolish? Having begun by the Spirit, are you now being perfected by the flesh?” Paul argues that the gospel is by faith in both justification and now in sanctification as well. The believers’ growth is just as supernatural as the believers’ birth. The Judaizers were trying to make sanctification naturalistic, rather than supernaturalistic. (3:4) “Did you suffer so many things in vain—if indeed it was in vain?” What suffering is Paul referring to? (1) The suffering could refer to the persecution they already endured (cf. Gal. 6:12). (2) The suffering could refer to circumcision—a repeated theme of the letter. Did they go through with circumcision—only to discover that their suffering was pointless? (3) The suffering could refer to falling under law. (3:5) “So then, does He who provides you with the Spirit and works miracles among you, do it by the works of the Law, or by hearing with faith?” God’s miraculous work and power cannot be coaxed or manipulated by law-living. The term “provides” (epichorēgeō) literally means “to convey as a gift, give, grant” or “to provide (at one’s own expense), supply, furnish” (BDAG). In other words, Paul is asking, “Did God perform miracles because you worked for them? Of course not!” How can gifts be earned? Many believers think that if they act better, then God will start to move. But the key to releasing God’s power is faith—not works. Argument #6: Abraham was justified by faith, rather than works. Paul has already given evidence about the truth of the gospel from his testimony, the testimony of the churches, and the testimony of the other apostles. Here, he appeals to the testimony of OT Scripture. (3:6) “Even so Abraham believed God, and it was reckoned to him as righteousness.” Paul cites Abraham as the premier model of faith (Gen. 15:6). He didn’t work to earn God’s favor. Instead, he had faith and this is how he gained God’s righteousness. Likewise, Scripture predicted that all the (Gentile) nations would be blessed through Abraham. Consequently, the Gentile nations would be blessed through faith—not works. (3:7-8) “Therefore, be sure that it is those who are of faith who are sons of Abraham. 8 The Scripture, foreseeing that God would justify the Gentiles by faith, preached the gospel beforehand to Abraham, saying, ‘All the nations will be blessed in you.’” Paul quotes from the Abrahamic Covenant here (Gen. 12:3). This verse does not abrogate the Abrahamic Covenant for ethnically Jewish people (i.e. replacement theology). After all, Paul only quotes from the portion of the Abrahamic Covenant that was literally fulfilled in the Gentiles (“All the nations will be blessed through you,” Gen. 12:3). Paul does not abrogate the rest of the Abrahamic Covenant as being fulfilled in the Church. He isn’t addressing eschatology, but soteriology here. (Gal. 3:8-14) Did Paul properly handle the OT? (3:9) “So then those who are of faith are blessed with Abraham, the believer.” Gentiles are “blessed” through the Abrahamic Covenant, because they follow in the footsteps of Abraham. (3:10) “For as many as are of the works of the Law are under a curse; for it is written, ‘Cursed is everyone who does not abide by all things written in the book of the law, to perform them.’” Why does Paul cite Deuteronomy 27:26? Paul is showing that “blessing” does not come through Law, but through the promise of Abraham. Deuteronomy 27 insists that a “curse” comes on people who are law breakers. Do the Galatians really want to go back under Law, when this brings a “curse”? (3:11) “Now that no one is justified by the Law before God is evident; for, ‘The righteous man shall live by faith.’” Paul cites Habakkuk 2:4 to show that “righteousness” comes from faith—not Law. (3:12) “However, the Law is not of faith; on the contrary, ‘He who practices them shall live by them.’” He next cites Leviticus 18:5 to show that law and faith are mutually exclusive. If believers really want to go the route of law, then they need to take on the entire mantle of the law—not just certain parts. (3:13) “Christ redeemed us from the curse of the Law, having become a curse for us—for it is written, ‘Cursed is everyone who hangs on a tree.’” Why does Paul cite Deuteronomy 21:23? He does so in order to show that Jesus—the only One who ever followed the law perfectly—took up the Cross so that he could be our “Curse Bearer.” In other words, why was Jesus cursed by the law (of Deuteronomy 21:23)? He took our “curse” for us. Does the Law override the Abrahamic Covenant? Paul’s adversaries probably asked if the Law abrogated the Abrahamic Covenant. But Paul argues just the opposite: The Law cannot override the Abrahamic Covenant, because this original covenant was unconditional and cannot be added to. (3:15) “Brethren, I speak in terms of human relations: even though it is only a man’s covenant, yet when it has been ratified, no one sets it aside or adds conditions to it.” Paul appeals to the practice of everyday covenants (or contracts). Once a contract is signed, it cannot be altered. For instance, if you signed a mortgage with the bank, the bank cannot change the interest rates, timeline, or rules of the mortgage after it is signed. (3:16) “Now the promises were spoken to Abraham and to his seed. He does not say, ‘And to seeds,’ as referring to many, but rather to one, ‘And to your seed,’ that is, Christ.” Paul applies this illustration to the promise given to Abraham and his “seed” (i.e. Jesus). Once God made this unconditional promise, he would never revoke it. (Gal. 3:16) Was the seed singular or plural? (Gal. 3:17) Was Paul wrong in saying that 430 years passed between Moses and Abraham? (3:17-18) “What I am saying is this: the Law, which came four hundred and thirty years later, does not invalidate a covenant previously ratified by God, so as to nullify the promise. 18 For if the inheritance is based on law, it is no longer based on a promise; but God has granted it to Abraham by means of a promise.” The Law came 430 years after the Abrahamic Covenant. Imagine signing a lease to rent a house, only to have the landlord double the rent after six months. This is unthinkable! What is the purpose of signing a contract if the terms can be capriciously changed? Paul uses this same logic to show that the Law did not change God’s original promise of blessing through the Abrahamic Covenant. If the Law doesn’t bring a blessing, then why did God give us the Law? Again, you could imagine Paul’s opponents asking such a question: Does the Law not have any purpose then? (3:19) “Why the Law then? It was added because of transgressions, having been ordained through angels by the agency of a mediator, until the seed would come to whom the promise had been made.” The Law had a purpose, but that purpose was not to abrogate the promise of faith through the promised seed. Instead, the purpose was to point us to the promised seed: Christ. The NASB states that we have the Law “because of transgressions” or “for the sake of defining transgressions” (see NASB footnote). The Law showed us our need for a Savior. (3:20) “Now a mediator is not for one party only; whereas God is only one.” Jewish believers were quick to affirm that “the Lord is one” (Deut. 6:4). (3:21) “Is the Law then contrary to the promises of God? May it never be! For if a law had been given which was able to impart life, then righteousness would indeed have been based on law.” There is nothing wrong with the Law. There is only a problem with the way the Judaizers were using or applying the Law. They were using it to gain “righteousness,” and Paul flatly denies this. (3:22-23) “But the Scripture has shut up everyone under sin, so that the promise by faith in Jesus Christ might be given to those who believe. 23 But before faith came, we were kept in custody under the law, being shut up to the faith which was later to be revealed.” In Greek, the order of the words shows emphasis. Here “shut up” (NASB) or “imprisoned” (ESV) or “declares… a prisoner of sin” (NIV) starts at the beginning of the sentence (Greek synekleisen). This shows that the Law is actually there to convince people of their complete and total inability to attain righteousness on their own (cf. Rom. 3:9-20). Of course, the Judaizers were teaching the exact opposite message, claiming that they could gain righteousness through the Law. (3:24) “Therefore the Law has become our tutor to lead us to Christ, so that we may be justified by faith.” The Law is a like a teacher or “tutor” (literally a “child-conductor”) who instructs us to come to faith in Christ. (3:27) “For all of you who were baptized into Christ have clothed yourselves with Christ.” This is similar to an astronaut putting on a spacesuit. Once he’s inside the suit, you can only see the suit—not the astronaut. Now that we are placed into Christ, God sees Jesus when he looks at us. (2) The Galatians had been falling back under law. What are some red flags that we can see when believers are starting to fall under law? (3) Compare and contrast being (1) rebellious with being (2) rule-based with having a (3) relationship with God under grace. In Judaism a boy passed from adolescence to manhood shortly after his twelfth birthday, at which time he became “a son of the law.” In the Greek world the minor came of age later, at about eighteen, but there was the same emphasis on an entering into full responsibility as an adult. At this age, at the festival of the Apatouria, the child passed from the care of his father to the care of the state and was responsible to it. Paul is using this custom to describe believers. We are in a state of “already-not-yet.” We are heirs of God, but we haven’t been given our inheritance yet. (4:2) “But he is under guardians and managers until the date set by the father.” In Roman culture, the father would set the time for his son to take over. This seems parallel with the concept of being under a “tutor” until Christ came (Gal. 3:25). And yet, the parallel isn’t perfect. The “tutor” (paidagōgos) relates to the child’s education, while the “guardian” (epitropous) relates to the child’s estate. The flow of thought is that the people were under a tutor with the Law, but this brought them to Christ. Are they really going to go back under these elementary principles again? They just came out of them! (Gal. 4:3) What does Paul mean by “the elemental things of the world”? “God sent forth His Son, born of a woman, born under the Law…” God had a preexistent Son, who was later born. Jesus served “under the Law,” so that we could be “released from the Law” (Rom. 7:6). (4:5) “[God sent forth His Son] so that He might redeem those who were under the Law, that we might receive the adoption as sons.” We were under the “elemental principles” of the world and “under the Law,” but now, God has made us his sons through Christ. He was born under these principles (i.e. the Law) in order to bring us into sonship. God gave his Son, so that we could become sons. Now that Christ has died for us, we have become sons—not slaves. Slaves get what they’re paid for their work. Sons might do the same actions as slaves (i.e. serving around the estate), but they do it for different reasons. For instance, both a son and a slave will work on the family property. Yet the son does so out of responsibility and love, while the slave does it out of obligation and fear. People under grace can work very hard, but it is motivated out of love and forgiveness—not fear of punishment. (4:6) “Because you are sons, God has sent forth the Spirit of His Son into our hearts, crying, ‘Abba! Father!’” God “sent forth” his Son (v.4). Here he “sent forth” his Spirit. Paul seems to be assuming that we can know our faith is true because we can have a direct contact with God through the Holy Spirit. If this isn’t an evidence for the believer, his argument would fall apart. He seems to be assuming that they know they are sons, through the internal witness of the Holy Spirit. (4:7) “Therefore you are no longer a slave, but a son; and if a son, then an heir through God.” We’re about to inherit a fortune from God. In fact, in an “already-not-yet” sort of way, we already have inherited this fortune. (4:8) “However at that time, when you did not know God, you were slaves to those which by nature are no gods.” This is pre-conversion (“when you did not know God… you were slaves”). (4:9) “But now that you have come to know God, or rather to be known by God…” I know the President of the United States as a public figure, but he doesn’t know me. Similarly, it’s more important that God knows me, than that I know him. “…how is it that you turn back again to the weak and worthless elemental things, to which you desire to be enslaved all over again?” Paul is asking, “Do you really want to go back to that old way of life?” This is like forfeiting your right as a son in order to become a slave (Lk. 15:18-21). Paul’s heart is broken to see these young believers turning against the gospel and turning against him. (4:12) “I beg of you, brethren…” Paul makes a personal plea. “…become as I am, for I also have become as you are…” Paul uses himself as a model of grace. This isn’t boasting. He has already argued that he was a persecutor of the church, and God changed his life. For Paul to not use himself as a model of grace would be to discount God’s work in his life. “…You have done me no wrong.” It would have been easy for Paul to express his personal hurt and pain. But instead, he rights that he is angry for their sake—not his own. Paul makes this issue personal, but he does so by making it about the other person—not himself. (4:13) “But you know that it was because of a bodily illness that I preached the gospel to you the first time.” This speaks of God’s sovereignty. Somehow God could use sickness as an opening for the gospel. We are not sure what Paul means by “bodily illness” or “weakness of the flesh” (see NASB footnote). Some argue that it could be a consequence of the torture Paul suffered by stoning or lashing; it could be malaria; it could be a congenital illness. We simply are not sure—though it could have to do with Paul’s eyes or eyesight (“you would have plucked out your eyes and given them to me,” v.15; cf. 2 Cor. 12:7). (4:14) “And that which was a trial to you in my bodily condition you did not despise or loathe, but you received me as an angel of God, as Christ Jesus Himself.” Paul is reminding them of their former relationship. They overlooked his physical illness or deformity. Paul’s physical condition must have been embarrassing or gross to look at. Yet the Galatians were willing to look at the message—not the man. A later apocryphal work gives this description of Paul: “A man small in size, bald-headed, bandy-legged, well-built, with eyebrows meeting, rather long-nosed, full of grace. For sometimes he seemed like a man, and sometimes he had the countenance of an angel” (The Acts of Paul, 2.3). (Gal. 4:14) Isn’t it arrogant for Paul to compare himself to Christ in this way? (4:16) “So have I become your enemy by telling you the truth?” Sometimes, in Christian friendships, we have to be willing to tell the truth at the risk of the friendship. He was in danger of losing them as friends for his commitment to the truth. This further supports that Paul was not a “man pleaser” (Gal. 1:10). (4:17) “They eagerly seek you, not commendably, but they wish to shut you out so that you will seek them.” When Paul writes that the Judaizers have “shut you out,” he is drawing from Galatians 3:22-23, where Paul wrote that “Scripture has shut up everyone under sin [synkleiō].” He’s connecting the dots for them: The false teachers have turned the Galatians against Paul by putting them back under law. (4:18) “But it is good always to be eagerly sought in a commendable manner, and not only when I am present with you.” Military leader Christopher Kolenda argues that a “disciplined group” will do the right thing—even when no leaders are around. (4:20) “…I could wish to be present with you now and to change my tone, for I am perplexed about you.” Paul was deeply distraught over the spiritual lives of these believers. He realizes that his “tone” was harsh. He would rather talk with them face-to-face. The term “perplexed” (aporeo) means “to be in a confused state of mind, be at a loss, be in doubt, be uncertain” (BDAG). Paul had times of real confusion in his ministry. (4:21) “Tell me, you who want to be under law, do you not listen to the law?” Paul turns the tables on his opponents. He uses the law to make his case for grace. (4:22) “For it is written that Abraham had two sons, one by the bondwoman and one by the free woman.” He tells the account of Abraham’s “two sons,” both of whom symbolically represent law and grace. (4:23) “But the son by the bondwoman was born according to the flesh, and the son by the free woman through the promise.” Ishmael was born naturally. Isaac was born supernaturally. (4:24-28) “This is allegorically speaking, for these women are two covenants: one proceeding from Mount Sinai bearing children who are to be slaves; she is Hagar. 25 Now this Hagar is Mount Sinai in Arabia and corresponds to the present Jerusalem, for she is in slavery with her children. 26 But the Jerusalem above is free; she is our mother. 27 For it is written, ‘Rejoice, barren woman who does not bear; break forth and shout, you who are not in labor; for more numerous are the children of the desolate than of the one who has a husband.’ 28 And you brethren, like Isaac, are children of promise.” Jewish people are born naturally according to their genes, but believers are born supernaturally according to the Spirit. (Gal. 4:24) Are we allowed to interpret the OT allegorically? (Gal. 4:27) Why does Paul quote Isaiah 54:1? (4:29) “But as at that time he who was born according to the flesh persecuted him who was born according to the Spirit, so it is now also.” From the account of Sarah and Hagar, Paul shows that law and grace (works and promise) are mutually exclusive. He also draws the parallel of persecution: Legalists had the freedom that grace brings into people’s lives, and this leads to persecution. Paul himself was this way before meeting Christ (Gal. 1:13, 23), and so were the legalists (Gal. 5:11; 6:12). (4:30) “But what does the Scripture say? ‘Cast out the bondwoman and her son, for the son of the bondwoman shall not be an heir with the son of the free woman.’” Paul demonstrates that Sarah and Hagar could not live side by side (citing Genesis 21:10, 12). Sarah called for Hagar to be “cast out.” In the same way, Paul is calling for the Judaizers to be “cast out” of the Christian community. (4:31) “So then, brethren, we are not children of a bondwoman, but of the free woman.” Paul reaffirms the identity of these believers as sons of God—children of the promise. Paul shows that the slaves do not inherit the promise, but the sons do. Do you want to be slaves or sons? (1) Compare and contrast what it’s like to live your Christian life as a slave versus as a son. (2) How do legalists view believers under grace? Vice-versa? What do they see in each other that pits them against each other? (3) Paul was deeply distraught over the spiritual lives of the Galatians—without making his feelings the main issue (4:12, 20). Many Christian leaders and disciple-makers handle admonition by making the issue personal. What consequences might this have if we handle admonition in this way (i.e. making it about our hurt feelings, rather than about the spiritual progress of the person we’re mentoring)? Far from leading to licentiousness, the grace of God leads to a truly transformed life. Some commentators argue that the transformation of believers is “the most powerful argument of all.” While this may be overstated, it is powerful considering the fact that the Judaizers were arguing that Paul’s gospel led to licentiousness. (5:1) “It was for freedom that Christ set us free; therefore keep standing firm and do not be subject again to a yoke of slavery.” What sort of freedom is Paul referring to here? In context, the freedom refers to the freedom from the Law. We are free to sin, but we are not free to stop sinning. Jesus said, “Everyone who commits sin is the slave of sin” (Jn. 8:34). Sin has an addictive component that controls us. As Paul argues in Romans 6, a lifestyle of sin is inconsistent with our new identity in Christ (cf. Gal. 5:13 below). However, since we are sons (and not slaves), we are free from sin. Jesus continued, “The slave does not remain in the house forever; the son does remain forever. So if the Son makes you free, you will be free indeed” (Jn. 8:35-36). (5:2) “Behold I, Paul, say to you that if you receive circumcision, Christ will be of no benefit to you.” Paul writes about taking circumcision in the present tense. He isn’t trying to slam those who have already taken circumcision, but rather, he’s trying to avoid more of this legalism from happening. Once you’re circumcised, we shouldn’t try to become “uncircumcised” (1 Cor. 7:18; cf. 1 Macc. 1:15). (5:3) “And I testify again to every man who receives circumcision, that he is under obligation to keep the whole Law.” Law and grace are mutually exclusive. You can’t just follow a little bit of the law. If you’re going to take the path of the law, then you need to take the whole law. Paul mentions circumcision here, but he also alludes to holy days (4:10), as well as food laws (2:12). (5:4) “You have been severed from Christ, you who are seeking to be justified by law; you have fallen from grace.” Again, it’s one or the other. (Gal. 5:4) Does this passage teach that Christians can lose their salvation? (5:5) “For we through the Spirit, by faith, are waiting for the hope of righteousness.” Instead of working, Paul is waiting. This could be an allusion back to the story of Abraham waiting for Isaac in the last chapter, rather than working to make things happen with Ishmael through Hagar. (5:6) “For in Christ Jesus neither circumcision nor uncircumcision means anything, but faith working through love.” Paul isn’t anti-circumcision or anti-Jewish (after all, he was both circumcised and Jewish!). He shows here that the point of following God is love—not Law (Gal. 5:14; cf. Rom. 13:10; Gal. 6:15). These believers started off well, but they slowed down over time because of legalistic teaching. Paul used this metaphor of “running” to refer to his own ministry in Galatians 2:2 (“for fear that I had been running, or had run, in vain”). When Paul asks, “Who hindered you from obeying the truth?” he is essentially saying that the false teachers’ arguments have been proven false. Now he is making the call for them to get back with God’s truth on grace. (5:8) “This persuasion did not come from Him who calls you.” Whatever “persuasion” the false teachers used, it was not based on truth (v.7), and it was not from God (v.8). These false teachers seemed persuasive to these young believers, but Paul is expecting them to be able to withstand these false teachers (v.10). (5:9) “A little leaven leavens the whole lump of dough.” The “leaven” is the persuasion of the false teachers. (5:10) “I have confidence in you in the Lord that you will adopt no other view; but the one who is disturbing you will bear his judgment, whoever he is.” How does Paul have such confidence in them? He must be trusting that the truth will have a resonating effect in their lives. (5:11) “But I, brethren, if I still preach circumcision, why am I still persecuted? Then the stumbling block of the cross has been abolished.” Paul isn’t claiming that he preached circumcision. Instead, he’s saying that if he was hypothetically preaching circumcision, then he wouldn’t be getting persecuted. Since he’s getting persecuted, it shows that he’s not preaching circumcision. Jewish preachers were not under persecution at this time from the Romans or from Christians. The only ones who were persecuted for their preaching were believers, because they were preaching a “stumbling block” (i.e. skandalon, or the “scandal of the Cross”). (5:13) “For you were called to freedom, brethren; only do not turn your freedom into an opportunity for the flesh, but through love serve one another.” The freedom here is not meant to encourage sinning, but to encourage serving. It must be possible to abuse grace. But what is the solution? Fear? Threats? Law? No, the solution to avoid sin is not less grace, but more. After understanding the grace of God, why would we want to sin more? (5:14) “For the whole Law is fulfilled in one word, in the statement, ‘You shall love your neighbor as yourself.’” Love is the point—not laws (citing Lev. 19:18). If our hearts were changed to actually love others, we wouldn’t need a list of rules to direct us. (5:15) “But if you bite and devour one another, take care that you are not consumed by one another.” False teaching leads to disunity in the church. In fact, this divisiveness could rip the church apart. (5:16) “But I say, walk by the Spirit, and you will not carry out the desire of the flesh.” Instead of having a sin focus, we should have a Spirit focus. God doesn’t look to rules. His own nature is pure goodness, so he doesn’t need to appeal to a moral code to conduct himself. Also, God doesn’t love people based on fear of judgment, but rather based on the security of his own nature and his own identity as God. He wants us to learn to love in the same way. The point is to rip our eyes off of our self-effort, and secure them on the love and power of God. (5:17) “For the flesh sets its desire against the Spirit, and the Spirit against the flesh; for these are in opposition to one another, so that you may not do the things that you please.” This relates to Paul’s argument in Romans 7:14-25. Our struggle with sin will be ongoing. There is only victory when we “walk” by the Spirit (v.16), or are “led” by the Spirit (v.18), rather than being focused on the Law. In other words, the battle is not between myself and my flesh, but between the Spirit and my flesh. (5:18) “But if you are led by the Spirit, you are not under the Law.” Note how this is parallel to verse 16. In both verses we “walk” or are “led” by the “Spirit.” This must mean that “not carry[ing] out the desire of the flesh” and “not [being] under Law” are also parallel ideas. Again, Paul’s discourse in Romans 5-8 expands on this theme. Impurity (akatharsia) means “any substance that is filthy or dirty, refuse” or “a state of moral corruption” (BDAG). Sensuality (aselgia) is also translated “licentiousness.” It means a “lack of self-constraint which involves one in conduct that violates all bounds of what is socially acceptable, self-abandonment” or to “give oneself over to licentiousness” (BDAG). Idolatry (eidololatria) means to “commit unlawful deeds connected with polytheistic worship” (BDAG). Enmities (echthra) refers to hatred or hostility. It can be understood as having hostility toward God (Jas. 4:4) or toward people (Lk. 23:12). Since it occurs in the context of both false religion and interpersonal conflict, the usage is not clear. Both types of hostility could be in view—namely, we could hate God and hate his people. Strife (eris) literally refers to “rivalry” or being “quarrelsome.” This is defined as “engagement in rivalry, especially with reference to positions taken in a matter, strife, discord, contention” (BDAG). Jealousy (zelos) can be positive or negative. It can refer to “intense positive interest in something… zeal, ardor, marked by a sense of dedication” (BDAG). Or it can refer to “intense negative feelings over another’s achievements or success, jealousy, envy.” (BDAG). In a negative sense, it means to be dedicated to envying the belongings of another person (e.g. gifts, good looks, finances, blessings?). Outbursts of anger (thymoi) can be defined as an “intense expression of the inner self, frequently expressed as strong desire, passion, passionate longing” (BDAG). This is the same word used of God’s anger (Rev. 16:19; 19:15). Yet God’s anger is a controlled anger—unlike ours. Disputes (eritheiai) was used before the NT to refer to “a self-seeking pursuit of political office by unfair means” (BDAG). Dissensions (dichostasiai) means to create factions. This would include pitting people against each other. Factions (haireseis) means “a group that holds tenets distinctive to it, sect, party, school, faction” (BDAG). In later history, it was used of a “heretical” sect. Envying (phothonoi) is similar to jealousy above. Drunkenness (methai) means “‘unrestrained revelry’ [that] may influence methai in the direction of [a] drinking-bout” (BDAG). Carousing (komoi) originally had a good connotation of having a celebratory feast together. Later, it was used “in a bad sense [of] excessive feasting” (BDAG). Consider asking discussion questions for a few of these qualities, depending on the needs of your group. Have people explain what relative victory would look like for a few of them, and what it would look like to pursue victory in each. (Gal. 5:21) Will sinners not “inherit the kingdom of God”? “But the fruit of the Spirit is love…” The term “fruit” is in the masculine singular in Greek. This means the fruit of the Spirit is one virtue: love. The rest of these qualities unpack what it means to be a loving person, who is being transformed by God. This isn’t a list of rules. Instead, it’s a picture of a transformed person. Joy (chara) means “the experience of gladness” (BDAG). While the feeling of “joy” is fleeting, we can always choose to rejoice (Phil. 4:4). We can choose to rejoice even during times of “sorrow” (2 Cor. 6:10). This occurs through believing the promises of God (Rom. 15:13). This is independent of ministry fruit and success. Paul says he could have this even in the midst of others competing with him in ministry (Phil. 1:17-18). Peace (eirene) refers to a “state of concord, peace, harmony” (BDAG). In the OT, this is the word translated into Greek from the Hebrew shalom. Brown writes, “In the LXX eirēnē is almost invariably used to translate the Heb. šālômh.” It could be the inner peace given to us by Christ (Rom. 15:13; Phil. 4:6-7; Jn. 14:27; 16:33) or the peace we can have between believers (Rom. 14:19; Eph. 4:3; 1 Pet. 3:11; Mt. 5:9). Patience (makrothymia) can be defined as the “state of remaining tranquil while awaiting an outcome, patience, steadfastness, endurance” (BDAG). It can also refer to the patience needed while preparing for battle. Brown writes, “Being strictly military terms, the various words are readily used as metaphors in connection with the battles of life.” This is the ability to wait on God before the battle and not hit the panic button. This refers to waiting on God “in season or out of season” (2 Tim. 4:2). Kindness (crestotes) refers to “uprightness in one’s relations with others, uprightness” or “the quality of being helpful or beneficial, goodness, kindness, generosity” (BDAG). Brown defines this as “a friendly nature.” Jesus was strong and fierce, but when kids saw him, they wanted to crawl all over him like a jungle gym. Goodness (agathosyne) can be defined as “moral goodness in relation to God who is perfect.” This would refer to standing up for what’s right without being self-righteous. Can people really predict what my advice will be in advance? Or can I be easily manipulated? Faithfulness (pistis) refers to placing trust in God. Self-control (egkrateia) can be defined as “restraint of one’s emotions, impulses, or desires, self-control” (BDAG). Paul believed this quality related to our spiritual rewards and generally not being disqualified (1 Cor. 9:25). “Against such things there is no law…” When we’re in the Spirit and have this inner change of heart, why do we need laws? Laws cannot change our hearts to become people of this caliber and character. (5:24) “Now those who belong to Christ Jesus have crucified the flesh with its passions and desires.” The key to gaining victory over the “deeds of the flesh” is to realize that our old self (the flesh) has been crucified. That person we hate, that we’re frustrated with, that constantly disappoints us: he’s dead! God didn’t renovate or change us. Instead, he killed us at the Cross. He started over with a “new creation” (2 Cor. 5:17). (5:25) “If we live by the Spirit [justification], let us also walk by the Spirit [sanctification].” Now that we’re a new creation, we are to believe in that new identity and walk in it. (5:26) “Let us not become boastful, challenging one another, envying one another.” Instead of getting the focus on others in competition, we are supposed to get the focus onto Christ in sanctification. Is “love” one of the most distinguishing features of my leadership of others? Do the people that I lead consider me their friend? (1) Is it wrong to read books and materials on our major sin issues that we’re struggling with (v.16)? At what point does it become a sin-focus to do this? (6:1) “Brethren, even if anyone is caught in any trespass…” Some commentators believe that Paul specifically has a “repentant Judaizer” in mind here. However, while “anyone” (anthrōpos) is in the singular, Paul is using that word in a generic sense (see NET note). This is why the NASB translates this section with “anyone” for “any trespass.” Paul has more than simply false teaching in mind. “…you who are spiritual, restore such a one in a spirit of gentleness; each one looking to yourself, so that you too will not be tempted.” A “spiritual” (pneumatikos) person is not a “ghost” or a “spirit.” Paul uses this term to describe those who are walking according to the Spirit or are oriented around the Spirit (Gal. 5:25). Therefore, with these sort of people, Paul calls for gentleness and humility. After all, we all struggle with sin, and we should be careful not to have a self-righteous attitude. Such self-righteousness could result in an opportunity for us to have a similar fall. This fits with the overall theme of Galatians: self-righteousness results in more sin—not less. (6:2) “Bear one another’s burdens, and thereby fulfill the law of Christ.” In context, “bearing one another’s burdens” refers to restoring a brother in sin. For this entire book, Paul has been writing against law. Now, he writes positively toward law, but he calls it “the law of Christ.” Instead of a list of moral duties, the main thought is loving our brother. (6:3) “For if anyone thinks he is something when he is nothing, he deceives himself.” How does this verse connect to the previous verse? Walking in the way of Jesus means to restore others with “gentleness” and avoiding self-righteousness (v.1). It means serving sinful brothers by carrying their burdens (v.2). When we think about a lifestyle of servant leadership like this, we realize that this is the antithesis of pride. Paul jabs at our pride, reminding us not to “think we are something, when we are nothing.” No one is “such a big deal” that they cannot wash the feet of fellow sinners. (6:4) “But each one must examine his own work, and then he will have reason for boasting in regard to himself alone, and not in regard to another.” We typically boast by comparing ourselves to others (2 Cor. 10:12). Earlier, Paul wrote that we should not “become boastful, challenging one another, envying one another” (Gal. 5:26). Instead of comparing ourselves to others (i.e. legalism), Paul encourages us to make a fair comparison: Is our work commensurate with my own gifts, talents, and opportunities? We should take our work to the Lord and rejoice in what he has empowered us and led us to do. This is what Paul means when he later writes that he “boasts… in the cross of our Lord Jesus Christ” (Gal. 6:14). Whatever work we’ve done is only possible through the grace of God through Christ. Elsewhere, Paul writes, “But by the grace of God I am what I am, and His grace toward me did not prove vain; but I labored even more than all of them, yet not I, but the grace of God with me” (1 Cor. 15:10). (6:5) “For each one will bear his own load.” Note the connecting word “for.” God has certain works that he wants us each to accomplish (Eph. 2:10), and he has made us stewards of our gifts, talents, and opportunities. We can’t pass this “load” off on other person. “Burdens” (baros) means an “experience of something that is particularly oppressive” (BDAG). In the Christian community, we move in to help others carry the burdens that they cannot carry themselves. “Load” (phortion) means “that which constitutes a load for transport” (BDAG). This can be understood as a “‘shoulder pack.” In Christian community, we should give people the dignity to carry what they are able to carry, teaching them responsibility. To show the difference, imagine hiking in the woods for several miles. A big, strong athletic man asks you, “Hey buddy, could you carry my book bag and tent on this hike?” You’re happy to help, so you throw his pack on top of yours, hiking three miles to the campsite. The same principle is true of Christian community. We don’t take people’s shoulder packs if they have the ability to carry these themselves. (6:6) “The one who is taught the word is to share all good things with the one who teaches him.” Why does Paul shift to the subject of financial giving, and how does this relate to the context? This would be a case of bearing someone’s burden (v.2). Christian leaders and teachers cannot afford to lead and teach full-time, while working at a secular job. Paul makes the principle of verse 2 very practical here. (6:7) “Do not be deceived, God is not mocked; for whatever a man sows, this he will also reap.” In context, this passage refers to financial giving. Thus “sowing” and “reaping” would refer to the giving of money and the gaining of rewards. Paul uses the same language to refer to financial giving elsewhere: “Now this I say, he who sows sparingly will also reap sparingly, and he who sows bountifully will also reap bountifully” (2 Cor. 9:6). (Gal. 6:7) Does this passage teach karmic law? (6:8) “For the one who sows to his own flesh will from the flesh reap corruption, but the one who sows to the Spirit will from the Spirit reap eternal life.” Again, eternal rewards are in view here. (6:9) “Let us not lose heart in doing good…” A lifestyle of sacrificial love might be discouraging at times. The term “lose heart” (enkakōmen) means “to lose one’s motivation in continuing a desirable pattern of conduct or activity, lose enthusiasm, be discouraged” (BDAG). Paul struggled with discouragement like the rest of us, but he modeled how to persevere in faith (2 Cor. 4:1, 16; Eph. 3:13). Much of our battle over discouragement is through prayer (Lk. 18:1). (6:10) “So then, while we have opportunity, let us do good to all people…” Our time or “opportunity” is going to close at some point. While the window is open, we should make our investment count. “…and especially to those who are of the household of the faith.” Why does Paul prioritize doing good to believers over non-believers? Consider a flight attendant who tells passengers, “In the event of a decompression, an oxygen mask will appear… If you are travelling with a child or someone who requires assistance, secure your mask on first, and then assist the other person.” Initially, this might sound cruel: Why should we take care of ourselves first? What about the children?! Yet this principle isn’t selfish, but strategic. After all, if we don’t have air flowing to our lungs, we won’t be able to help anyone. Something similar is at play in serving fellow believers as a priority: If the church dries up and atrophies, then there won’t be anyone to serve the non-Christian world. (6:11) “See with what large letters I am writing to you with my own hand.” Paul typically wrote through an amanuensis (or scribe) to write his letters (Rom. 16:22). Here, Paul writes the conclusion with his own hand (cf. 2 Thess. 3:17). (6:12) “Those who desire to make a good showing in the flesh try to compel you to be circumcised, simply so that they will not be persecuted for the cross of Christ.” There must have been religious pressure to conform to old covenant Judaism (note the religious pressure confronting Peter in Galatians 2:12). The truly brave action was to stick to the truth of the new covenant. (6:13) “For those who are circumcised do not even keep the Law themselves, but they desire to have you circumcised so that they may boast in your flesh.” At the heart of the matter, circumcision was a hypocritical show. The Judaizers couldn’t keep the “whole law” as Paul has been arguing throughout the letter (Gal. 5:3). Paul wrote earlier that we should boast about how God has empowered and led us into good work before the Lord—not comparing ourselves to others or in front of others (6:4). Here, Paul notes that the Judaizers were boasting about how many Gentiles they got circumcised. (6:14) “But may it never be that I would boast, except in the cross of our Lord Jesus Christ, through which the world has been crucified to me, and I to the world.” Rather than boasting about circumcising Gentile converts, Paul boasted in Jesus Christ and his life-changing Cross. This is the difference between boasting in Christ’s righteousness and boasting in self-righteousness. (6:15) “For neither is circumcision anything, nor uncircumcision, but a new creation.” The key to spiritual growth is to recognize that we’re a new creation in Christ. (6:16) “And those who will walk by this rule, peace and mercy be upon them, and upon the Israel of God.” Premillennialists and Amillennialists debate this passage. Is Paul including “the Israel of God” with the Gentile believers, or is he showing that these ethnic groups are still separate? (Gal. 6:16) Does the church inherit the promises of Israel? How do we balance “bearing each other’s burdens” (v.2) with “bearing our own load” (v.5)? When should we encourage a fellow believer to carry their own load, rather than helping them out? Why does God elevate giving aid to Christians above non-Christians (v.10)? How would you respond to someone who said that this is bigotry? J. B. Lightfoot, The Epistle of St. Paul to the Galatians (1865). James Montgomery Boice. The Expositor’s Bible Commentary: Romans through Galatians: with the New International Version of the Holy Bible. Grand Rapids: Zondervan Pub. House, 1976. 412. Cole, R. A. (1989). Galatians: an introduction and commentary (Vol. 9, pp. 24–25). Downers Grove, IL: InterVarsity Press. Fung, R. Y. K. (1988). The Epistle to the Galatians (p. 3). Grand Rapids, MI: Wm. B. Eerdmans Publishing Co.
 Witherington, Ben. Grace in Galatia: a Commentary on St. Paul’s Letter to the Galatians. Grand Rapids, MI: W.B. Eerdmans Pub., 1998. 5. Carson, D. A., Douglas J. Moo, and Leon Morris. An Introduction to the New Testament. Second ed. Grand Rapids, MI: Zondervan, 2005. 464. Carson and Moo write, “The apostle visited the southern area on his first missionary journey (Acts 13-14), but he never explicitly said to have visited the northern area—though many think that this is what is meant in Acts 16:6 and 18:23.” Carson, D. A., and Douglas J. Moo. An Introduction to the New Testament. Second ed. Grand Rapids, MI: Zondervan, 2005. 458. Ben Witherington writes, “It is in order to point out that there is no clear evidence even in Acts that Paul ever evangelized the cities of the northern part of Galatia. At most there might be a reference to his passing through the region and strengthening existing converts in the area, but even this conclusion is doubtful.” Witherington, Ben. Grace in Galatia: a Commentary on St. Paul’s Letter to the Galatians. Grand Rapids, MI: W.B. Eerdmans Pub., 1998. 5. Boice writes, “We know of no churches at all in the north at this early date, either as mentioned in the New Testament or outside it, and what information we do have seems to point to the establishing of churches (which, moreover, remained relatively weak) fairly late in early church history. By contrast, we do have a record of the founding of the strong, important churches of the southern region, into which all that Paul tells us about his initial preaching to the Galatians fits nicely.” James Montgomery Boice. The Expositor’s Bible Commentary: Romans through Galatians: with the New International Version of the Holy Bible. Grand Rapids: Zondervan Pub. House, 1976. 415. Gundry writes, “A traversing of North Galatia would have required an unlikely wide detour to the northeast.” Gundry, Robert Horton. A Survey of the New Testament. 4th ed. Grand Rapids, MI: Zondervan Pub. House, 2003. 353. Ben Witherington writes, “It is not really feasible to argue that Paul detoured some 200 kilometers north and east out of his way in order to pass through old ethnic Galatia on his way between Lystra dn Ephesus.” Witherington, Ben. Grace in Galatia: a Commentary on St. Paul’s Letter to the Galatians. Grand Rapids, MI: W.B. Eerdmans Pub., 1998. 5. Carson, D. A., Douglas J. Moo, and Leon Morris. An Introduction to the New Testament. Second ed. Grand Rapids, MI: Zondervan, 2005. 459. Ben Witherington writes, “The phrase found in Acts 16:6 can indeed refer to one region, not two, the Phrygian part of Galatia. In other words Luke means that Paul passed through the territory already covered (including presumably the city of Pisidian Antioch).” Witherington, Ben. Grace in Galatia: a Commentary on St. Paul’s Letter to the Galatians. Grand Rapids, MI: W.B. Eerdmans Pub., 1998. 6. Carson, D. A., and Douglas J. Moo. An Introduction to the New Testament. Second ed. Grand Rapids, MI: Zondervan, 2005. 461. Witherington, Ben. Grace in Galatia: a Commentary on St. Paul’s Letter to the Galatians. Grand Rapids, MI: W.B. Eerdmans Pub., 1998. 9. Witherington, Ben. Grace in Galatia: a Commentary on St. Paul’s Letter to the Galatians. Grand Rapids, MI: W.B. Eerdmans Pub., 1998. 12. Cole, R. A. (1989). Galatians: an introduction and commentary (Vol. 9, p. 36). Downers Grove, IL: InterVarsity Press. Fung, R. Y. K. (1988). The Epistle to the Galatians (p. 28). Grand Rapids, MI: Wm. B. Eerdmans Publishing Co.
 See Marshall, I. Howard. New Testament Theology: Many Witnesses, One Gospel. Downers Grove, IL: InterVarsity Press, 2004. 209. Howard Marshall observes, “It would be difficult for Jewish Christians to shake off centuries of avoiding such occasions and also to stand up to the criticism that would inevitably come their way from non-Christian Jews who might be prepared to tolerate their eccentric beliefs about Jesus but who drew the line sharply at their non-Jewish practices.” Marshall, I. Howard. New Testament Theology: Many Witnesses, One Gospel. Downers Grove, IL: InterVarsity Press, 2004. 211. Fung, R. Y. K. (1988). The Epistle to the Galatians (p. 41). Grand Rapids, MI: Wm. B. Eerdmans Publishing Co.
 Cole, R. A. (1989). Galatians: an introduction and commentary (Vol. 9, p. 79). Downers Grove, IL: InterVarsity Press. Cole, R. A. (1989). Galatians: an introduction and commentary (Vol. 9, p. 92). Downers Grove, IL: InterVarsity Press. Büchsel, F. (1964–). ἱστορέω (ἱστορία). G. Kittel, G. W. Bromiley, & G. Friedrich (Eds. ), Theological dictionary of the New Testament (electronic ed., Vol. 3, p. 391). Grand Rapids, MI: Eerdmans. Büchsel, F. (1964–). ἱστορέω (ἱστορία). G. Kittel, G. W. Bromiley, & G. Friedrich (Eds. ), Theological dictionary of the New Testament (electronic ed., Vol. 3, p. 392). Grand Rapids, MI: Eerdmans. Fung, R. Y. K. (1988). The Epistle to the Galatians (p. 74). Grand Rapids, MI: Wm. B. Eerdmans Publishing Co.
 Cole, R. A. (1989). Galatians: an introduction and commentary (Vol. 9, p. 95). Downers Grove, IL: InterVarsity Press. Cole, R. A. (1989). Galatians: an introduction and commentary (Vol. 9, p. 187). Downers Grove, IL: InterVarsity Press. Fung, R. Y. K. (1988). The Epistle to the Galatians (p. 89). Grand Rapids, MI: Wm. B. Eerdmans Publishing Co.
 Cole, R. A. (1989). Galatians: an introduction and commentary (Vol. 9, p. 104). Downers Grove, IL: InterVarsity Press. Cole, R. A. (1989). Galatians: an introduction and commentary (Vol. 9, p. 106). Downers Grove, IL: InterVarsity Press. Beale, G. K., & Carson, D. A. (2007). Commentary on the New Testament use of the Old Testament (p. 34). Grand Rapids, MI; Nottingham, UK: Baker Academic; Apollos. Cole, R. A. (1989). Galatians: an introduction and commentary (Vol. 9, p. 119). Downers Grove, IL: InterVarsity Press. Cole, R. A. (1989). Galatians: an introduction and commentary (Vol. 9, p. 131). Downers Grove, IL: InterVarsity Press. Cole, R. A. (1989). Galatians: an introduction and commentary (Vol. 9, p. 132). Downers Grove, IL: InterVarsity Press. Cole, R. A. (1989). Galatians: an introduction and commentary (Vol. 9, pp. 133–134). Downers Grove, IL: InterVarsity Press. Cole, R. A. (1989). Galatians: an introduction and commentary (Vol. 9, p. 134). Downers Grove, IL: InterVarsity Press. Cole, R. A. (1989). Galatians: an introduction and commentary (Vol. 9, p. 153). Downers Grove, IL: InterVarsity Press. Cole, R. A. (1989). Galatians: an introduction and commentary (Vol. 9, p. 156). Downers Grove, IL: InterVarsity Press. Boice, J. M. (1976). Galatians. In F. E. Gaebelein (Ed. ), The Expositor’s Bible Commentary: Romans through Galatians (Vol. 10, p. 471). Grand Rapids, MI: Zondervan Publishing House. Cole, R. A. (1989). Galatians: an introduction and commentary (Vol. 9, pp. 157–158). Downers Grove, IL: InterVarsity Press. Cole, R. A. (1989). Galatians: an introduction and commentary (Vol. 9, p. 158). Downers Grove, IL: InterVarsity Press. Cole, R. A. (1989). Galatians: an introduction and commentary (Vol. 9, p. 160). Downers Grove, IL: InterVarsity Press. Cole, R. A. (1989). Galatians: an introduction and commentary (Vol. 9, p. 159). Downers Grove, IL: InterVarsity Press. Christopher Kolenda, Leadership: The Warrior’s Art (Army War College Foundation Press, 2001). Cole, R. A. (1989). Galatians: an introduction and commentary (Vol. 9, p. 175). Downers Grove, IL: InterVarsity Press. Cole, R. A. (1989). Galatians: an introduction and commentary (Vol. 9, p. 188). Downers Grove, IL: InterVarsity Press. Cole, R. A. (1989). Galatians: an introduction and commentary (Vol. 9, p. 191). Downers Grove, IL: InterVarsity Press. Cole, R. A. (1989). Galatians: an introduction and commentary (Vol. 9, pp. 203–204). Downers Grove, IL: InterVarsity Press. Brown, C., Wright, J. S., & Brown, C. (1986). M. L. Coenen, E. Beyreuther, & H. Bietenhard (Eds. ), New international dictionary of New Testament theology (Vol. 2, p. 552). Grand Rapids, MI: Zondervan Publishing House. Brown, C. Vol. 2: New international dictionary of New Testament theology. Grand Rapids, MI: Zondervan Publishing House. 1986. 98. Cole, R. A. (1989). Galatians: an introduction and commentary (Vol. 9, p. 224). Downers Grove, IL: InterVarsity Press. Cole, R. A. (1989). Galatians: an introduction and commentary (Vol. 9, p. 227). Downers Grove, IL: InterVarsity Press. Cole, R. A. (1989). Galatians: an introduction and commentary (Vol. 9, p. 232). Downers Grove, IL: InterVarsity Press. Cole, R. A. (1989). Galatians: an introduction and commentary (Vol. 9, p. 233). Downers Grove, IL: InterVarsity Press.